Bowl curving inward to footring base. Curved handle with hole at outer end. Sgraffito vertical stripes to exterior. Mottled blueish glaze to interior of bowl. Different colour to each bowl. Clear matte glaze to interior and exterior. Good condition with small chip to rim of one bowl. There is a story that sums up these David Boyd ramekins in my opinion. “The Emperors New Clothes.” Of average making, roughly decorated yet functional, but still, which is a mystery to me, highly collectable. They were made by husband and wife team David and Hermia Boyd back in the 1950s. David was born 23rd August 1924 at Open Country, 8 Wahrooga Cres. in Murrumbeena, he was the youngest of three sons to Merric and Doris Lucy Eleanor Boyd, David Gough Boyd is a member of the famous artistic Boyd family. His wife was Hermia Sappo Lloyd-Jones who was born in Sydney, New South Wales in 1931 to Herman (Jonah) and Erica Lloyd Jones. Herman was a Commercial Artist, Cartoonist and Illustrator. Like many successful artists of the period, Hermia first studied at the East Sydney Technical School. 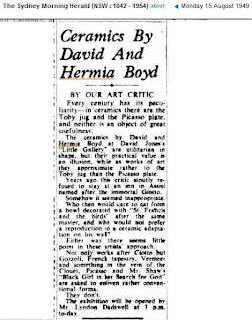 She was there studying sculpture with Lyndon Dadswell between 1945 and 1947, the same time as Guy Boyd. 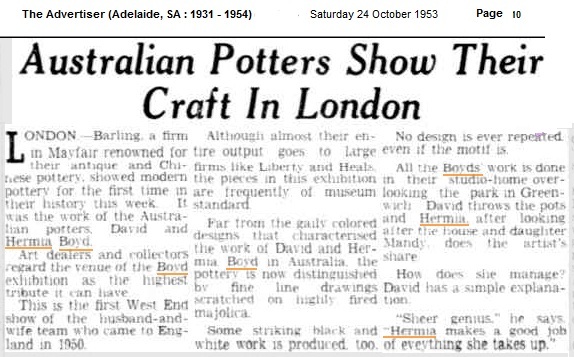 David was working with Guy (see Guy Boyd post) at Norma’s place in 1947. Dadswell, unlike the Boyds, had actually seen action in Syria and been badly wounded. He then became a war artist before later resigning his commission to become a teacher. He was also one of the best sculptors working in Australia at the time. David and Hermia married in 1948 and had three children; Amanda, Lucinda and Cassandra. 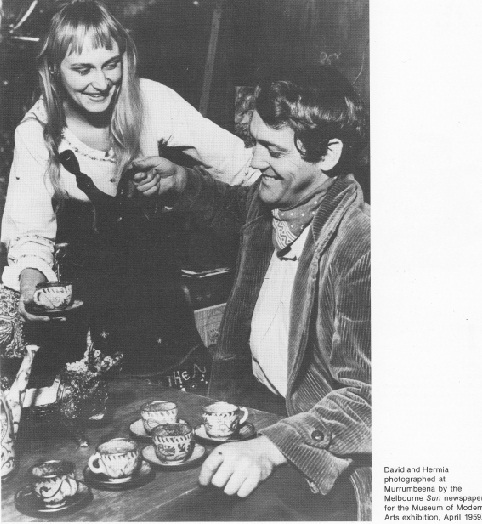 The couple set up a pottery in a shed in Paddington and with the help of Tom Sanders began producing their “Hermia Ware”. Much has been written about them and many chronologies exists of theirs and various Boyd family members lives and works so it is difficult to find anything new to say, so here goes. Interesting, because he never went to war. Like his brother Guy, he worked as a draughtsman, never got past Queensland and was discharged early because the Army believed that he had a “Psychopathic personality”. The Army also described his brother Guy as being of poor general intelligence. 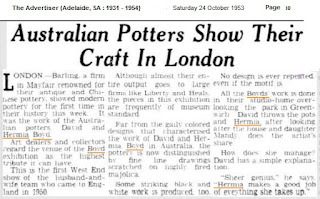 Allegedly the Australian Army was not prepared to accept these two Boyd’s “eccentricities” as readily as the Australian artistic community has. So drones, when you copy stuff of other people’s websites, at least do a modicum of research. Also, when considering the Boyd aversion to conflict, remember that their father volunteered to serve in World War One. Hermia died 25th January 2000, David Boyd died aged 87 on November 10 2011. from complications arising from a bout of pneumonia in hospital in Sydney, New South Wales. Hermia was a strong, talented and independent woman who deserves to be better known than just “and Hermia”. Much of their early output was pottery with David later returning to painting. These ramekins are of the typical primitive almost naïve style that I would describe as characterizing their work. If you look at the Hanstan blog, notice the similarity, except Hanstan is much, much better, but made much later. They stopped making ceramics in 1967 to concentrate on sculpture and painting, although he had begun to paint seriously in 1957. These stoneware ramekins were probably made in the late 1950s after their return from England. 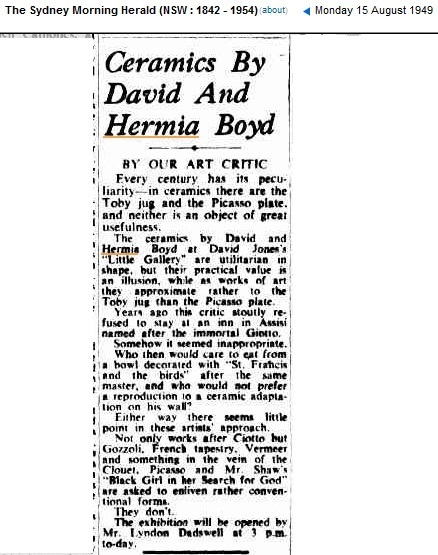 Their sell-out exhibitions were something different in the then very thin cultural fabric of 1950s Melbourne. In the land of the blind, the one eyed man is king. The colouring is interesting because David was quite obsessed with the use of Sfumato around this time and a smoky effect pervades their work. The design on these ramekins is similar to some of the early 1940s paintings of his father Merric. These guys were special. Thanks for this article!